BLINK! has been somewhat of a mystery to folks. A new dynamic movement with a lineup of fantastic names with no real purpose or identity, to some, but to me, BLINK! is the result of many "no's" turned yes. Every year, photographers have a line item budget for learning. We all sit around waiting for that perfect learning opportunity that will give us the take home items we need and will make us feel like we found the answer to all of our photography trials. The problem is that many times, in order to spend those dollars we have to compromise key components that might be valuable to us, whether that is the speaker(s) or lack there of, the location, the amount of attendees, the costs, or the lack of real life practical teaching that we can actually be applied. Personally, it has been challenging for Ike & I, as photographers to relate with the industry at times because of the lack of diversity among our industry leaders. There is so much talent but oftentimes the industry chooses to put those who are more familiar forward more consistently and many up and coming artists from different backgrounds who could provide a new and fresh perspective are overlooked. Instead of cursing the industry, becoming unsettled and apathetic, we decided to take action, thus the idea for BL!NK was born. The vision behind the BL!NK Conference was to create a conference situation that reflects the photography community ethnically, a place where a photographer could come and learn from a variety of talented photographers (both industry leaders and up-and-coming photographers) as well as, provide an intimate hands on learning environment (maximum registration is 50 people) that allows for true connection and diversity, a boutique experience for the thriving photographer. Conference will take place over the course of 3 days, 2 nights at the Aloft Nashville Downtown in Nashville, TN. Friday, November 1st will kick us off with a mixer and LIVE MUSIC in the the XYZ Lounge of the Aloft Hotel. Zach & Jody Gray: "How to Avoid What Most Small Business Do - Fail"
Named one of Nashville, Tennessee’s top wedding photographers in 2009, Zach and Jody Gray have quickly gained national recognition for their imagery and business savvy in the wedding photography industry. They have hosted numerous highly successful photography workshops in the states and overseas, and have been invited to speak at WPPI, Imaging USA, and SWPP in London. Their images have appeared in various publications including People, Southern Bride, and PPA Magazine. This award-winning couple has also been named by Westcott as one of their Top Endorsed Pros and are a part of the exclusive SanDisk Extreme Team. Did you know that 80% of small-business fail in five years? Within TEN years 96% of small-business fail. Listen to Zach & Jody share how to set up your business so you can defeat the statistics and avoid becoming a small-business casualty. While most photographers are statistically on track to fail – learn how to do what most photographers don't – WIN. Become a part of the winning percent! Dawn Davis: "Taking the Business Out of the Wedding"
"What can I say? I'm a blessed girl. If you would have told me back in April of 2005 that I would quit my job as an Accountant and become the Creative Director of a business with my husband, and that we would have the most amazing clients that make "ME" cry when they look at the work we've created for them, I would have thought you were crazy! BELIEVE would be the one word that I would say best represents what I am about. I believe in ME. I believe in my husband, I believe in our family. And I deeply believe in our dear Lord. I have sat in Oprah Winfrey's kitchen, been to Paris to photograph the wedding of Eva Longoria and Tony Parker. I have designed some of the most incredible books for Forest Whitaker, Maya Angelou, Tyler Perry, Oprah, and of course Eva. And most recently, Bob & I had the honor of photographing & designing for ABC's TV show The Bachelorette Ashley's wedding to J.P. in Pasadena, California. I pinch myself everyday. Every single day! I don't say this to boast, I say this because I believe! I believe that if I can do this, so can you. You can live the life you want you just need to believe in yourself, work hard, and move in a positive direction. Why not DREAM BIG? I do...!!! I want so much to see you succeed. I'm here to help! I enjoy sharing my knowledge and passion. And I look forward to meeting you!" "Tired of watching your competition excel in the industry or book a lot of weddings because they are under cutting your prices? Lets talk about how you can take the business out of the meeting and become more successful. The strategies that I will sharing with you are not costly, they are obtainable, and they work! I can't wait to see you all in Nashville." Audrey Woulard: "Photographing Children! Mastering the Connect"
Audrey's road to professional photography was simple…she began documenting the honesty in her children's lives. With a natural talent and a plan to keep it simple, she photographs exclusively with natural light, both indoors and out. She works on location and in her 2,200 sq.ft. studio in Downtown Chicago. In addition to her children's portrait work, Audrey also photographs high profile commercial assignments for clients, such as Pottery Barn Kids and IAM's pet food. She also conducts workshops at her studio for photographers across the world, and she's written a book discussing her approach to natural light photography, entitled "Natural EnLIGHTenment Photography." "After being in business for 11 years the one thing I've is a very solid return client base. I haven't marketed since 2006 and that is because I've mastered the connection." Joshua Dwain: "Storytelling & Creative Engagement and Wedding Photography"
Photography is what I love to do. I’m blessed to photograph wonderful couples who help fuel my creative pursuit. I love to take photographs. You may call me, eager, passionate, spirited, or even fervent. The simple fact is I truly love photography. "The key my talk is about NOT about magically being a creative wedding photographer, but giving you the tools to begin thinking differently so that you WILL be creative, becoming better at what you love doing so that you can seperate yourself from the pack." Alejandra Vidal: "The Power of Motion Storytelling"
I was born with blonde hair and English was my second language. Though I might argue that talking with my hands was my first language because I never seem to speak without using them! I lost myself in books as a child. I wore my pink leotard to bed and fell in love with films like E.T. I found inspiration everywhere. Lucky Charms cereal box. Perfume bottles. Lace. I'm not very different now. I have always been a story teller. I'm captivated by color, texture, emotion, and curves. These elements are different in everyone's story. When combined, similar to taste or smell, they trigger a memory. And that... well, that is what my makes my heart yearn: To share the emotion and memories of your story through my cinematography. To celebrate you. My hope is to inspire you to have self-love and imagination by embracing your individual style and building the confidence to exhibit it. I'm blessed to have a husband who encourages me each day. His faith in me motivates me to take risks -- to allow myself to make mistakes but keep moving forward." 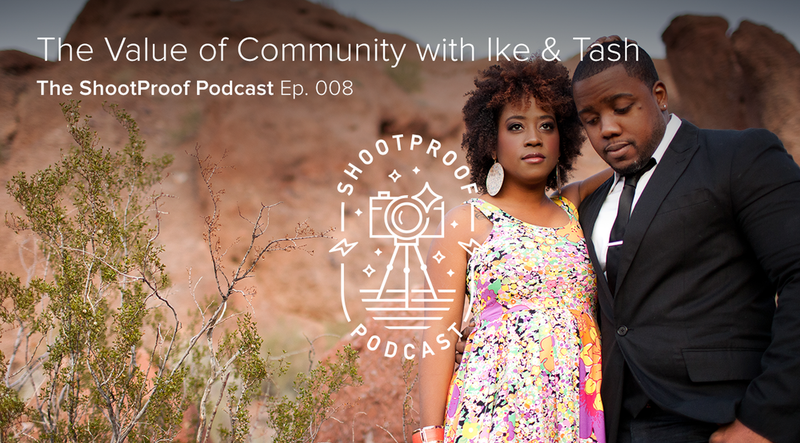 Ike & Tash Haynes: "The Street Team: How to Build a Loyal Senior Model Program That Generates Income for Your Business"
We are a husband wife photography duo based out of the Seattle Tacoma Area. We have been wedding and portrait photographers since early 2010 and have been working our niche market in the industry since then. We are well connected in our area and leaders of many community groups and forums online. We have been published in Junebug Weddings, Munaluchi Bridal, Life & Baby, Senior Style Guide and a few more to come! We started offering mentorships in late 2011 and it was in offering these mentorships that we were able to identify disparities in the photography education among photographers. We recognized the shortage of development in diverse communities and on the speaking circuit, which led us to the solution we call, BLINK! Connecting to the youth voice and vision can be challenging, staying up on trends and what is popular to ever-changing population of young people where “here today, gone tomorrow” has become “hot for a minute and on to the next,” can make it tough to build a senior model program that sticks and garners the excitement you need to keep your business growing and going. We are going to introduce you to our Street Team concept & the process of how to build a loyal group of young people who not only represent your business, but also inform it. Sunday November 3rd: will include 2.5 hours of on - location shooting with the speaker of your choice ( 1 and 8 ratio - which makes it PRETTY hands on) , along with more focused workshops in the afternoon around legal forms & contracts, marketing & branding and Lightroom Post - Processing and workflow. Registration includes all meals and training materials, as well as single occupancy complimentary hotel for the first 30 registrants (of which, because of a sponsor, there are still a few available). Registration for BLINK is currently $995 until September 30th of which it will increase to $1195. If you are looking for a something new, a fresh perspective -hands on, intimate experience to learn and grow your business from some of the most talented people in our industry BLINK is definitely for you! YOU do NOT want to miss it! For more information about BLINK visit the website here. Check out the BLINK PROMO video here & SHARE!!! Video by the very talented Alejandra Vidal of Imaginale Design! I have the joy of being a part of a beautiful photography community called Pursuit 31, a Christian community full of woman who like me are in LOVE with pictures and anything surround the creative process really. The last couple of years I have had the complete honor of leading a group of Seattle ladies both in online forum as well as in person and a couple of years ago (I know, I know... I have been meaning to blog this for a while now) I called up Karen, creator and founder of Pursuit 31 & suggested a Seattle retreat & the crazy idea of a wedding based around the children's board game "Candyland." I am ALL for the vintage wedding trend that has OVERTAKEN today's wedding industry BUT I am in love with BOLD bright colors. As a child, the game "Candyland" always was my favorite because of the mysterious stops along the board, Candy Castle, Gingerbread Plum Trees, Molasses Swamp, the Peppermint Forest.... and all of the really amazingly delicious iconic stops along the board. It was my favorite game, and I couldn't get enough of it. Daydreaming of bring it to life as a stylized wedding was truely a dream come true and WE LOVED the outcome. Brides, if you want to have a really amazing wedding and wow your guests, take a look at some of the fantastic details below! We also couldn’t have done it without these fabulous people! Thanks to : April Greer, Dawnet Davis, Isaiah Haynes for helping make this day such a success! More HUGE thank you’s to our FABULOUS models for braving the cold and rocking out these photos for us! These AMAZING companies deserve HUGE thanks! My love, my husband, my business partner, my best friend. Thank you so much for all you do for the business and me. You know I could not do it without you. You selflessly put in hours and hours to help me out, while still working a full time job to support us. Hours on end with me at sessions and weddings, after working long hours at the office. I cannot express to you how much I appreciate all you do! I know at times, our quality time suffers because I am always working, but I promise I will find a way to figure out the balance, and I will find people who will support me in that process. Just picture it – One day you will not have to go into work anymore, because your work will be with me. Our photography business supporting our family and us. But I know I cannot do it alone. I found a retreat through my Pursuit 31 group. It is a retreat of women who are going to address these very issues. Though we cannot afford it; I am determined to get myself there. I will do everything I can, because this – our marriage – is a priority to me. Thank you, my love, for believing in me. You are my biggest fan, and I love you. As you can tell from the letter to my husband above, my life story is paraphrased by this sentence by Latasha. My passion is photography, and like many of us, I am struggling to find time to balance family with work. And I have so many business questions that I could use hands on help with. My love for photography began back in college when I stumbled upon an elective class – photo 101. I instantly fell in love with it!! Of course, back then it was still film, so when I decided I could finally invest enough to open my own business my world got rocked! As you could imagine, I had to completely relearn my craft in the digital realm, and am still learning. It has been a difficult journey, but one that I am proud to say, I am pushing through. My husband has been an integral part in that process, as he has been my teacher. But as I continue to grow my business ,I struggle to find time for anything else, especially him. My marriage is a priority to me, as I am sure it is to all of you, so it breaks my heart to struggle to balance the two worlds. This retreat is just what I need. As my business is finally starting to grow, I need some help. Not only with details of how to balance it all, or help with the business questions; but also the relationships. I cannot tell you what it would mean to me to be able to attend this, learn from those willing to share, and build relationships that would build me up along with my business. Unfortunately, I have yet to figure out how to make a profit though my work has increased. It always seems that I need something else, or need to attend a conference, and that leaves me empty handed. I am determined to attend this retreat one way or another, but right now, I just to do not have the funds. This spot at the retreat could change not only my business, but my life; and I would be so blessed if I won!